Here's three beers I had this week that I decided to write about. Each one is from a different country. We start with Spain, then move to New Zealand and then to Norway. I also want to mention that normal photography will continue shortly. The Basqueland beer below uses my old Galaxy S3 that I was stuck with since my beloved Note 4 died. Never fear, I picked up a Galaxy S8 which has a phenomenal camera so the next two beers will be much clearer. 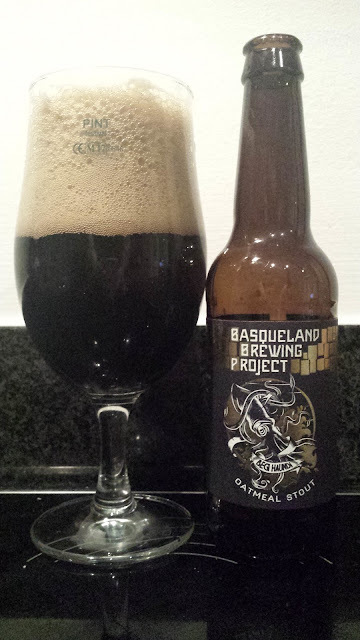 Begi Haundi is a 5.8% oatmeal stout from Basqueland Brewing. It's one of the beers I brought back from San Sebastian about this time last year so it has had a year or so to get over its mistreatment in the suitcase. I was pretty surprised to find it's rather carbonated for a stout but then again, Basqueland is run by Americans so it would be a little normal to have fizzy stout over there. The beer is all coffee and cream and it's rather bitter too which balances it out. Overall, I found it too fizzy for my taste but I did enjoy the rather full body. One thing that's rather interesting though is that when I compare what I found to Ratebeer, people are saying recently theirs had a thin body and low carbonation so I'm guessing the recipe has changed. So I scrolled back to about a year ago and I found that carbonation levels ranged from "no carbonation" to "moderate carbonation" and then "touch over carbonated" but in terms of body, they all agree it's robust or medium. It seems the beer is quite changeable so I suppose just grab one and judge for yourself and pretty much ignore what I think. That's good advice for all beer reviews really. Next we head to the other side of the planet and New Zealand's Garage Project based in Wellington. 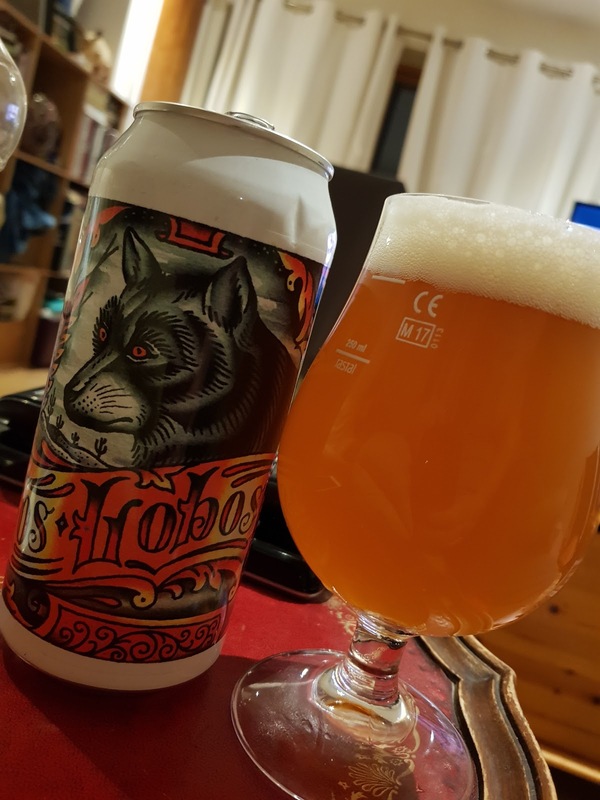 Los Lobos is an 8% DIPA and we are talking a proper DIPA here. Unfiltered but not a stupid juice bomb. This beer has a deep bitterness to balance the absolutely massive body but the hops are the showcase here. Simcoe, amarillo, and citra are used to perfection. It's big, packed full of mandarin and tropical fruits. It was one of the best DIPAs I've had in a long time actually. From the extreme south to the extreme north now and Noway's Lervig brewery. 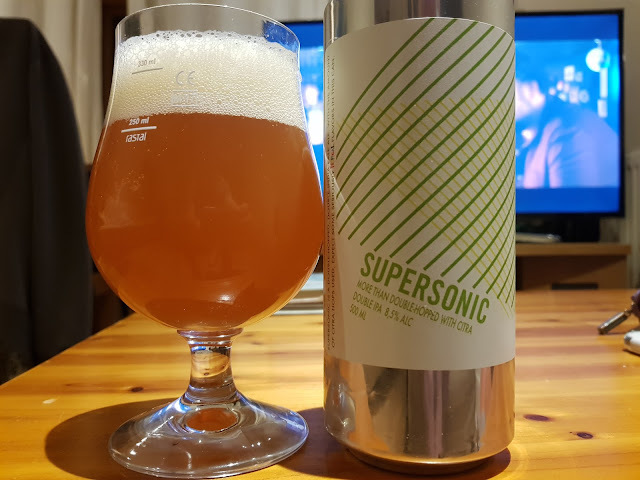 Supersonic is an 8.5% DIPA which is apparently more than double hopped with citra according to the can. I'm not sure what that means, perhaps citra in the boil and then more as dry hop but does it mean thrice being more than double? I had this directly after Los Lobos and on the face of it, it should be pretty much the same except .5% more ABV. It even looks pretty much the same, perhaps a shade darker as there was live yeast in there from what I could tell. That said, it just wasn't as complex or interesting as Los Lobos. That's not to say there's anything wrong with it, there's not, it's a bloody good DIPA but it just lacks that little extra dimension to bring it from a really good DIPA to a world beater. Perhaps my opinion was clouded by having Los Lobos in the same sitting as the bar was set incredibly high. All I can say is that if faced with a choice of Supersonic or Los Lobos and only one can be picked, it will be Los Lobos without a second thought.